The third installment in the turn-based jRPG franchise, developed by Level 5 for Nintendo portable devices. The story takes place in the American town of St. Peanutsburg, where the series' protagonist moves in with his parents. 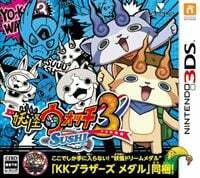 Yo-kai Watch 3 is a jRPG game. Like the previous parts of the series, it focuses on duels in which the main character uses small creatures called Yo-kai to help. The first installment of the cycle debuted in 2013 and became a great hit in Japan, which resulted in the appearance of an animated series, cinema films and a whole host of gadgets with the main characters. Yo-kai Watch 3 is produced by Level-5 studio, which was founded in 1998. Developers have in their portfolio such positions as Ni no Kuni, White Knight Chronicles or Rogue Galaxy. Just like the games from the Pokemon cycle, in the Country of the Cherry Blossom the described production is available in two versions - the following one Tempura i Sushi. They differ in the type of Yo-kai game, as well as in the small details of the story. In the West, they have been merged into one, simply entitled Yo-kai Watch 3. Action Yo-kai Watch 3 takes place in the town of St. Peanutsburg, located somewhere in the United States. The main character - Keita - moves there together with his parents from Sakura Town, but to his surprise both locations are not so different. It turns out that Yo-kai can also be found here, but just like in his hometown, nobody outside of him is able to see them. This extraordinary skill is provided by the protagonist of a special watch, which he once received as a gift. In the course of the game in Yo-kai Watch 3 We use this watch, making friends with other Yo-kai and helping people in the city. Sometimes it requires fighting with other creatures. If we emerge victoriously from the duel, we have a chance to integrate the opponent into our team. The plot sporadically moves to other locations where we take control of the second central character of the game - a bit crazy Inaho Misora. The fight plays an important role here, and in addition, the creators realized it in an interesting way. Two three-person Yo-kai teams face each other on the battlefield and perform their attacks in turn-based systems. When it's our turn, we draw special characters on the bottom screen of the console, which allows us to launch attacks. Touch control was also used during the exploration of the world - some activities, such as fishing, require the player to pass a specially designed mini-game. Graphic design in Yo-kai Watch 3 has been significantly improved compared to previous editions. The world and models were made with the use of cel-shading technique.